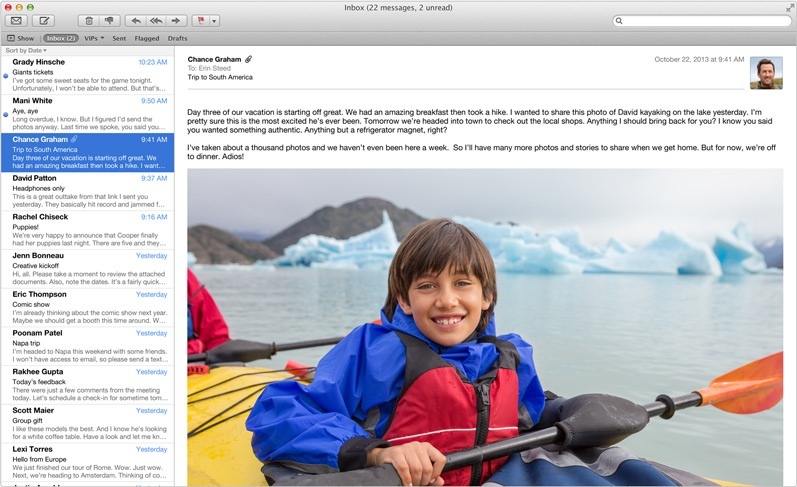 Apple is working on a fix to address issues with the native Mail client in OS X Mavericks, including problems with Gmail, stability, and smart mailboxes, reports 9to5Mac. There have been widespread reports of Mavericks users experiencing problems receiving messages, sorting messages into folders, and deleting messages. Apple is aware of the problem and has seeded an updated Mail app to both Apple employees and testers in Apple's AppleSeed customer program. - Use Mail with your usual Mail accounts, including iCloud, Gmail, Exchange, etc. - Read and move Mail messages to folders on your mail server, folders on your Mac, smart folders. - Mark messages read/unread in both your mail provider’s webpage and Mail and verify they stay in sync. Currently, the update is only available as a downloadable patch for Apple employees and testers rather than a regular update to Mavericks. While OS X 10.9.1 is well into development, it's not yet known whether the Mail update will roll out separately or be included with OS X 10.9.1. I'm hoping all native apps will be downloadable through the Mac App Store with future OS releases. Same goes for iOS, seems like the best way to send out updates as quickly as possible - rather than updating the entire OS itself. No wonder Mavericks was free... we're all beta testers! This is why I always wait until the x.0.1 version is released before I upgrade. Switched to AirMail, haven't looked back. I'm really impressed by just how many bugs the Mavericks version of Mail seems to have considering Apple haven't changed much in it this time round! I assume they've added support for all the new APIs but I don't see how that could break so much! I actually have to use the mouse and click a button now. The way you wrote that makes it seem like a ridiculously huge effort. Tried AirMail when it was beta testing, looked nice but resource hog and couldn't drag emails from one account to another like I can in Mail.app (big thing for me). I questioned why I was even using it. Came to the conclusion I was using it because it looked pretty. I questioned why I need my email app to look a bit prettier than the already neat looking Mail.app when I only look at the email itself and keep the client minimised the rest of the time. After taking that step back I realised Mail.app client was the best choice by far since it is lightweight, does everything I need and built into the OS. So pessimists, don't hate on Mail.app because it is not eye candy enough for you. You love to hate on things over the smallest stuff. What you think software isn't allowed to have teething issues on release? Do you get upset when you receive a folded bank note too? I don't get why iOS mail app is still so quick and efficient, but Mavericks mail app freezes and crashes so often. I have this issue where my mail app freezes after I type in an address. I always also get my mail minutes sooner in iOS than I do in Mail. Same with imessages -- instantaneous in iOS, delayed in Mavericks. If it works for iOS I don't understand why the same apps are ****** in Mavericks. Mail.app in Snow Leopard 10.6.8 was the best e-mail app I've ever used. So of course in Lion Apple had to go and mess it all up. It was so slow as to be unusable. Mountain Lion addressed the speed issues somewhat but I still see LOTS of annoying behavior (can't click-drag to select messages anymore - WTF; click on messages and have them get marked read, only to shortly afterwards reappear as being unread; delete large groups of messages and Erase all Trash folders yet the messages never got moved to the Trash; Erase Deleted Messages/In All Accounts would take less than a minute in Snow Leopard yet take several minutes in Mountain Lion, etc.). New releases are supposed to be better, not a backwards step.